From the inbox, Harris County Clerk Stan Stanart declares victory for voter ID. The final results of the 2014 Democratic and Republican March 4th Primary Elections have been approved by the Democratic and Republican Parties. The results show that less than 0.01% of the voters did not present one of the forms of photo identification required to vote at the poll. Total turnout for the March 4th Primary Elections was 193,491 voters; a 9.7% turnout. In the Republican Primary, 25 of the 139,703 voters voted provisionally because they did not present an acceptable photo ID. In the Democratic Primary, 10 of the 53,788 voters voted provisionally because they did not present an acceptable photo ID. As provided by law, within 6 days after Election Day, 4 Republican voters and 1 Democratic voter provided an acceptable Photo ID to the voter Registrar so that their provisional vote was counted. “The fact that almost all of the voters have complied with the photo ID law does not surprise me. The Texas Secretary of State’s office and my office have worked very hard to inform the public about the photo identification requirement,” asserted Stanart. The County Clerk’s office launched a comprehensive effort to make voters aware of the photo identification requirement as soon as the law went into effect last year. The campaign included billboards, social media, press releases, contact with community organizations and other contemporary forms of outreach. The Texas Secretary of State’s office, along with assistance with the Department of Public Safety, conducted an extensive outreach campaign as well. “I’m certain our educational efforts had an impact on compliance. But, an inherent awareness among citizens that a government issued photo identification is vital to the conduct of important daily personal transactions may be the underlying reason the voters were prepared to vote in these elections and will be prepared to vote in future elections,” concluded Stanart. I’m sorry, but this is meaningless. There were fewer votes cast in all of Harris County this March than there were in just the city of Houston last November. It is highly likely that the number of people who voted this March but didn’t vote last November is tiny, especially in the context of Harris County’s two million registered voters. As such, the overwhelming majority of people who voted this March are people who have had experience with voter ID. The reason there were fewer problems with enforcing the voter ID law in this second election is the same reason why there were fewer problems coping with the second ice storm we had this winter: The people who’d endured one of them before had some idea of how to cope with it the second time around. That doesn’t mean any of us welcomed the experience or saw any value in it. This November we are likely to see turnout in Harris County on the order of 700K to 750K, or as much as five times as many people as we had show up this March. The vast majority of the people whose first time dealing with voter ID will be this fall are people who by definition aren’t as engaged in the voting process and who very likely have received – and paid attention to – far fewer communications from campaigns, party officials, and election officials about what to expect. In addition, with turnout being so much higher, the likelihood of delays and people being frustrated by them will be that much higher. Stanart’s office has had its share of bumps in administering past elections. I’d be careful with the triumphalist rhetoric until after this November if I were he. In Texas, student IDs are not acceptable forms of ID for voting. In Alabama, an ID from any public or private college or university in the state can be used. 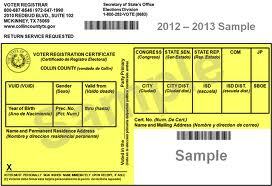 In Texas, government employer IDs, other than military IDs, cannot be used for voting. In Alabama, any federal, state, county, or city employee ID is acceptable. In Texas, only Texas drivers’ licenses and identification cards can be used. In Alabama, any ID issued by a state can be used. In Texas, to obtain a ‘free’ voter ID, a voter must use a birth certificate or other narrowly proscribed official documentation to get a voter ID. In Alabama, voters may use private employer IDs, high school IDs, and nursing home IDs to obtain a voter ID – and, if they don’t have any of those, they can use any non-photo documentation with the voter’s name and date of birth, including Medicare and Medicaid statements and official school transcripts. In Texas, election identification certificates are available only from select Department of Public Safety offices – and those notably aren’t available in every county. In Alabama, a voter ID can be obtained in each county at registrars’ offices. The problem with voter ID isn’t that it presents a minor inconvenience to a relative handful of zealous regular voters. The problem is that it presents an insurmountable obstacle to a roughly equivalent number of people who for all intents and purposes are now ineligible to vote for no good reason. Furthermore, this is exactly what the law was intended to do. That’s why this law is bad, and that’s why it needs to be declared unconstitutional. The successful execution of a low-turnout primary election has no bearing on that. Peggy Fikac, who also wrote about this, comes to similar conclusions. I was never convinced there was a huge fraud problem necessitating a voter ID law, but I am also not persuaded that there is a huge problem with disenfranchising eligible voters by requiring voters to present an ID. I am surprised that most of those who bothered to vote a provisional ballot did not make the further effort to prove their eligibility to vote during the 6 day grace period. Also, I would note that there may have been many eligible voters who (1) did not even come to the polling place when unable to find their ID, or (2) came and upon learning they lacked proper ID on their person, just went home rather than spend time completing a provisional ballot. I know of two such cases anecdotally. I cannot imagine how one could quantify the numbers of those categories. Voter fraud alarmists are the fraudsters. Disenfranchising even a single voter is reprehensible.